Mansions of Rastafari is an umbrella term for the various groups of the Rastafari movement. Such groups include the Bobo Ashanti, the Niyabinghi, the Twelve Tribes of Israel, and several smaller groups, including African Unity, Covenant Rastafari, Messianic Dreads and the Selassian Church. The term is taken from the Biblical verse in John 14:2, "In my Father's house are many mansions." Many individual Rastas are only loosely affiliated with these Mansions, or not at all, in keeping with the principle of freedom of conscience, a general distrust of institutionalism shared by many, and the teachings of Haile Selassie I as Emperor that "faith is private" and a direct relationship requiring no intermediary. [original research?] Beliefs differ between the mansions, with varying views on the Bible, dreadlocks, diet, and ganja. The Twelve Tribes of Israel is a Rastafari group founded in Kingston, Jamaica in 1968, and now functioning worldwide. Its founder, Vernon Carrington, was known as Prophet Gad, and taught his students to read the Bible 'a chapter a day'. Twelve Tribes of Israel (Ysrayl) Rastafari organization accept Jesus Christ as Master and Saviour, and Haile Selassie I as divinely chosen by the Creator to represent him on earth. Due to the stigma associated with slavery and the use of the name "Jesus" by outsiders, Some Rastafari prefer to use the ancient names of The Messiah (Ha Mashiyahch) which is Yahshuwah, Yahoshua or Yahshua (original sacred Hebrew name) and Yesus/I-Yesus Kristos (Amharic/Ge'ez name). 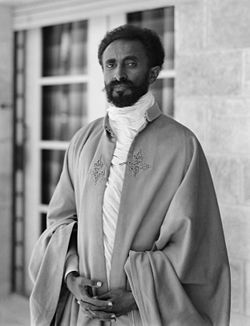 Haile Selassie is seen as a divinely anointed king in the lineage of Kings David and Solomon. While he is considered a type/representation of The Messiyah in Kingly Character, he is not Yahshuwah The Messiyah/Yesus Kristos himself, but a representative of the everlasting Davidic covenant, which is to be fulfilled by The MessiahYahshuah/ I-Yesus Kristos when he returns as The Conquering Lion of the Tribe of Judah (Yahudah). The Twelve Tribes symbology is based on Yahqob's (Jacob) 12 sons, and correspond to the months of the ancient Ysraylite (Israelite) calendar, beginning with April and Reuben. The Most High Jah/Yah/YHWH gave Yahqob a new name which was Ysrayl (Israel). Some people further relate the 12 Tribes to metaphysical signs. Thus Bob Marley came from the Tribe of Yowseph (Joseph), the eleventh of the biblical Ysrayl's (Israel's) twelve children (because he was born in February). The name Levi in Ijahman Levi represents the third child who was born to Yahqob (Jacob). Another well known reggae group of this organization is Israel Vibration. Bob Marley, by quoting a biblical passage about Yowseph (Joseph) on the album cover of Rastaman Vibration, was acknowledging his own support for this sect. Dennis Brown, Freddie McGregor, Mikey Dread, Luciano and many other roots reggae artists were associated with The Twelve Tribes of Israel (Ysrayl). Some hold that everyone should be free to light up the pipe - but only if they want to. Like its precursor Nyahbinghi (see below), Twelve Tribes is very anti-racist and often preaches love toward all people, but still ascribe to black uplift as foretold by Marcus Garvey. The Nyahbinghi Order (also known as Haile Selassie I Theocratical Order of the Nyahbinghi Reign) is the oldest of all the Rastafari mansions, named after Queen Niyabinghi, a 19th-century Ugandan ruler who fought against the British Empire. It may also be spelled in a variety of other ways, such as "Nyabinghi", "Nyahbinghi", "Niyahbinghi" and so on. It was first used to describe an East African possession cult located in the areas of south Uganda and north Rwanda in 1700 C.E. (Hopkins, p. 259). Early missionaries and anthropologists named the Uganda/Rwanda clans, the Niyabinghi Cult, because their culture was based on the veneration of the goddess spirit, Niyabinghi. The Niyabinghi Cult is said to have thrived due to the possession of the goddess Niyabinghi through dance and religious seances. Various oral traditions exist that explain how Niyabinghi became a revered goddess. One account states that in 1700 C.E., two tribes inhabited the Uganda/Rwanda area: the Shambo and Bgeishekatwa. Queen Kitami, who is said to have possessed a sacred drum of phenomenal power, ruled the Bgeishekatwa tribe. When Kitami died, she was given immortal status and the name Niyabinghi (Freedman, p. 63). Another tradition states that Queen Niyabinghi ruled the Northwestern Tanzani kingdom of Karagwe and married the chief of Mpororo from the southwestern kingdom of Uganda. Envious of the Queen's power, the ruler ordered her death which is said to have brought "untold horrors to his kingdom" (Kiyaga-Mulindwa, p. 1163). After her death, her spirit continued to be praised and to possess her followers for the next two centuries. The Bgeishekatwa tribe was eventually defeated by the Shambo clan who adopted the Bgeishekatwa’s rituals for Nyahbinghi. A century later, the Shambo were defeated by the cultivating Kiga clan (there are legends that the Shambo’s defeat is connected to the attempt to kill a woman who was possessed by Nyahbinghi) (Freedman, p. 74). Once the Kiga tribe reigned over the land, Niyabinghi became known as a matriarchal power, and the Kiga’s century-rule is characterized as the reign of the Niyabinghi priestesses. Kiga women who received Nyahbinghi’s blessings and were said to be possessed by Nyahbinghi came to be called bagirwa (Hopkins, p. 259). Eventually, the revered bagirwa gained political dominion and became governors of the Kiga people, living a dual life of political and spiritual leadership. The bagirwa, including Muhumusa, remained governors of the Kiga people until 1930 after losing their land to British, German, and Belgian imperialists, which they fought for a period of twenty years. The singular form of the word "bagirwa" is "mugirwa". At some point, men became Nyahbinghi priests as well (Freedman, pp. 80–81). The Nyahbinghi Theocracy Government was named for a legendary Amazon queen of the same name, who was said to have possessed a Ugandan woman named Muhumusa in the 19th century. Muhumusa inspired a movement, rebelling against African colonial authorities. Though she was captured in 1913, alleged possessions by "Niyabinghi" continued, mostly afflicting women. However, Nyahbinghi doesn't have any linkage to or relationship with Ethiopian history or Haile Selassie, it is a part of the Rastafari movement and a manifestation of the wisdom of Jah. Niyabinghi are considered the strictest mansion of the Rastafari movement in Jamaica, preaching the ideals of a global theocracy to be headed by Emperor Haile Selassie I, whom they proclaim to be the promised Messiah and incarnation of Jah, the Supreme. They have also been known to be very anti-racist. But reflect a deep belief in the uplift of the black race. They also express that oppressors towards anybody will be punished by Jah. People of the Nyahbinghi faith often (but not always) affiliate themselves with nonviolence. while not necessarily approving of St. Augustine's other principles. The Niyabinghi resistance inspired a number of Jamaican Rastafari, who incorporated what are known as niyabinghi chants (also binghi) into their celebrations (groundations). The rhythms of these chants were eventually an influence of popular ska, rocksteady and reggae music. Three kinds of drums (called "harps") are used in niyabinghi: bass, also known as the "Pope Smasher" or "Vatican Basher", reflecting a Rasta association between Catholicism and Babylon, the middle-pitched funde and akete. The akete (also known as the "repeater") plays an improvised syncopation, the funde plays a regular one-two beat and the bass drum strikes loudly on the first beat, and softly on the third beat (of four). When groups of players get together, only one akete player may play at any one time. The other drums keep regular rhythms while the akete players solo in the form of a conversation. Niyabinghi drumming is not exclusive to the Niyabinghi order, and is common to all Rastafari. Its rhythms are the basis of Reggae music, through the influential ska band, the Skatalites. It is said that their drummer revolutionized Jamaican music by combining the various Niyabinghi parts into a 'complete' "drum kit," which combined with jazz to create an entirely new form of music, known as ska. Niyabinghi rhythms were largely a creation of Count Ossie, who incorporated influences from traditional Jamaican Kumina drumming (especially the form of the drums themselves) with songs and rhythms learned from the recordings of Nigerian musician Babatunde Olatunji. Binghi chanting typically includes recitation of the Psalms, but may also include variations of well-known Christian hymns. Though Count Ossie is clearly the most influential Binghi drummer, practically inventing the genre, the recordings of Ras Michael and the Sons of Negus, as well as the Rastafari Elders, have contributed to the popularity of the music. Though Niyabinghi music operates as a form of Rasta religious music outside of Reggae, musicians such as Bob Marley and even non-Rastas such Prince Buster (Muslim) and Jimmy Cliff used the idiom in some songs. Recently, dancehall sensation Sizzla, American roots-Reggae artists such as Groundation and Hip hop have used Niyabinghi drums extensively in their recordings. Though sometimes claimed to be a direct continuation of an African cultural form, Niyabinghi drumming is best seen as the voice of a people rediscovering their African roots. Combining Jamaican traditions with newly acquired African ones, Count Ossie and others synthesized his country's African traditions and reinvigorated them with the influences of Nigerian master-drummer Babatunde Olatunji, as a comparison of Count Ossie's Tales of Mozambique and Olatunji's earlier Drums of Passion will reveal. Indeed, it is that combination of inherited traditions and conscious rediscovery of lost African traditions that makes Niyabinghi drumming—and Rasta—so powerful. ^ "BBC - Religions - Rastafari: The Twelve Tribes of Israel". ^ "BBC - Religions - Rastafari: Nyahbinghi Order". Freedman, Jim. Nyabingi: The Social History of an African Divinity. Tervuren, Belgique: Musee Royal De L' Afrique Centrale, 1984. Hopkins, Elizabeth. “The Nyabingi Cult of Southwestern Uganda.” Protest and Power in Black Africa. Ed. Robert I. Rotberg and Ali A. Mazrui. New York: Oxford University Press, 1970. 258-336. Kiyaga-Mulindwa, D. “Nyabingi Cult and Resistance.” Encyclopedia of African History. Ed. Kevin Shillington. 3 vols. New York: Fitzroy Dearborn, 2005.